연세대학교 신촌세브란스 병원에서 ESD indication criteria에 따른 outcome에 대한 메타분석을 발표하였습니다 (Park SW. Surg Endosc 2016). 결론을 옮깁니다. 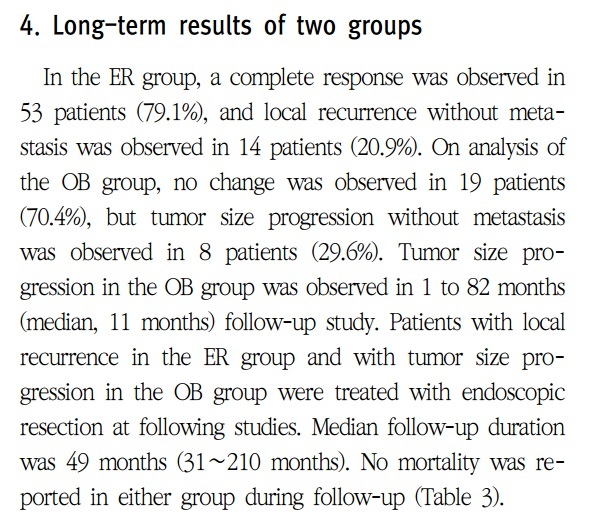 "This meta-analysis suggests that the EI group showed acceptable long-term outcomes with local recurrence rate that was not significantly inferior, although the metachronous recurrence rate was higher compared with that in the AI group." 그러나 아래 그림과 같이 complete resection rate와 curative resection rate는 확실히 차이가 납니다. 지금까지의 연구는 모두 시술 후 병리결과에 따른 diagnostic group을 기초로 분석된 연구입니다. 메타분석도 마찬가지일 수 밖에 없습니다. 여하튼 absolute indication으로 생각하고 시술했는데 expanded indication으로 나왔던 환자가 대부분일 것 같습니다. 이번 메타분석의 결과가 pretreatment expanded indication 환자에 대한 ESD를 정당화하는 자료로 읽히지 않기를 바랍니다. NTT Medical Center Tokyo에서 2명의 gastric ESD 경험이 없는 초보자를 animal model을 이용하여 colon ESD를 가르켰던 경험을 발표하였습니다 (Ohata K. Endosc Int Open. 2016 Mar; 4(3): E333-E339). 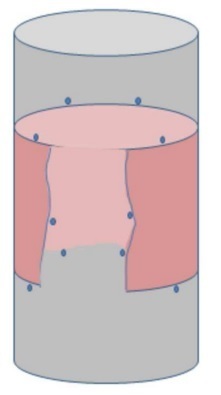 Ex vivo porcine "proximal colon" model. 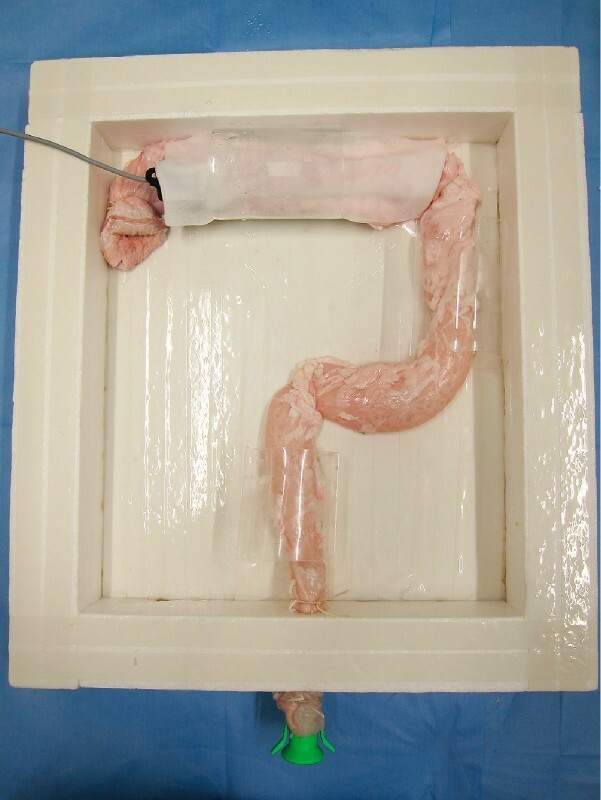 The porcine colorectum was placed upside down and anchored inside a square box, so as to simulate the human colon. 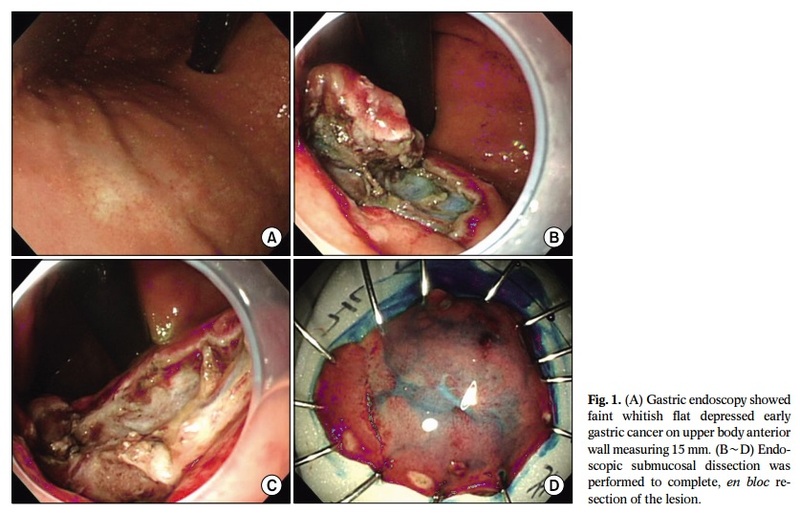 "In conclusion, our trainees achieved relatively high self-completion and R0 resection rates without the occurrence of any severe complications, suggesting that our training programs are useful for trainees without experience performing gastric ESD. Ex vivo animal models, which were constructed to simulate the paradoxical endoscopic movements and a lumen with many folds and flexions, may be useful for the acquisition of colorectal ESD-specific techniques. The presence of fibrosis was identified as a significant independent predictor of a prolonged operation time; thus, cases with fibrosis should be avoided during the introductory stages of performing colorectal ESD. To achieve safe and proficient colorectal ESD, prior intensive learning and expert supervision are also necessary." 옳은 이야기입니다. 초심자는 열심히 learning 해야 하고 expert는 열심히 supervision 해야 합니다. 개인적으로는 와파린만 빼고 모두 동의합니다. 3) Direct Oral Anticoagulants (DOAC): For low-risk endoscopic procedures we suggest omitting the morning dose of DOAC on the day of the procedure (very low quality evidence, weak recommendation). For high-risk endoscopic procedures, we recommend that the last dose of DOAC be taken ≥ 48 hours before the procedure (very low quality evidence, strong recommendation). For patients on dabigatran with CrCl (or estimated glomerular filtration rate, eGFR) of 30-50 mL/min we recommend that the last dose of DOAC be taken 72 hours before the procedure (very low quality evidence, strong recommendation). In any patient with rapidly deteriorating renal function a haematologist should be consulted (low quality evidence, strong recommendation). 4) Post endoscopic procedure: If antiplatelet or anticoagulant therapy is discontinued, then we recommend this should be resumed up to 48 hours after the procedure depending on the perceived bleeding and thrombotic risks (moderate quality evidence, strong recommendation). ESD에 대한 코멘트도 있었습니다. 위 ESD로 인한 출혈률은 5.8%였는데 사망례도 있었습니다. 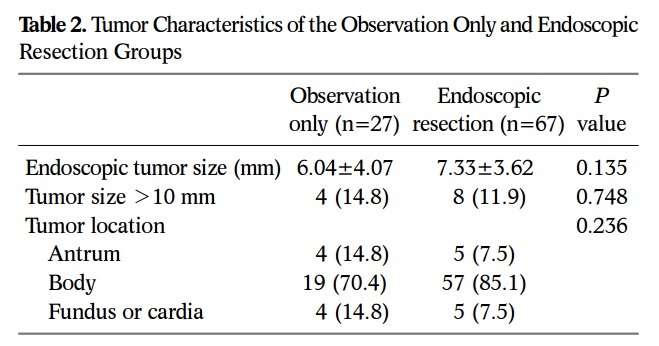 Compared with EMR, ESD presents a higher procedure-related bleeding rates irrespective to the location of the lesion treated (Cao Y. Endoscopy 2009). This is mostly a problem in the stomach; the mean rate of post procedural bleeding across five recent large studies (>6,000 patients in total) of gastric ESD was 5.8%. Nevertheless, severe consequences were rare (1 death, 3 angiographic interventions, and no surgery). In the oesophagus, a recent meta-analysis of 15 studies provided a pooled estimate of post-ESD delayed bleeding of only 2.1 %. 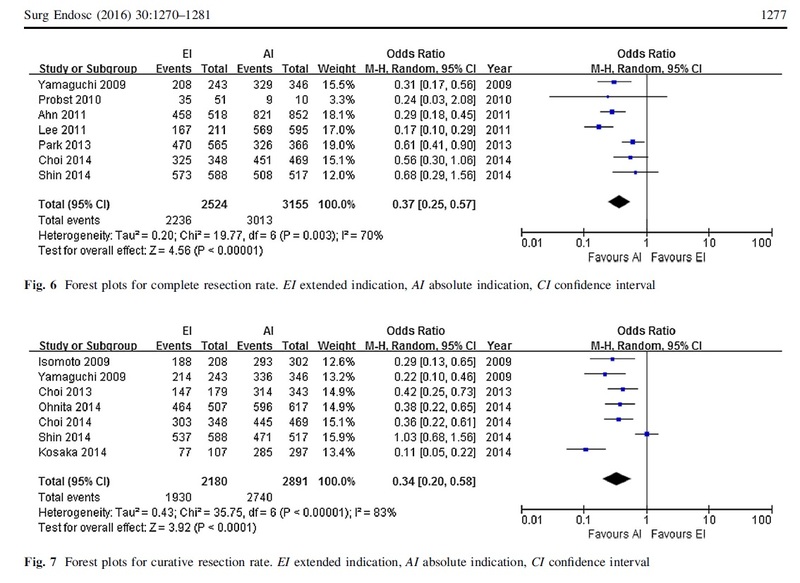 With respect to colonic ESD, a systematic review (total, 2,774 patients) found a bleeding rate of 2%. No bleeding-related mortality was noted in oesophageal or colonic studies. A large multicentre prospective Japanese register confirmed this low rate of post colorectal ESD bleeding with only 18/816 events (2.2%). A higher bleeding rate was reported by a small prospective European study, though this included only rectal lesions, which present a higher risk of delayed bleeding. 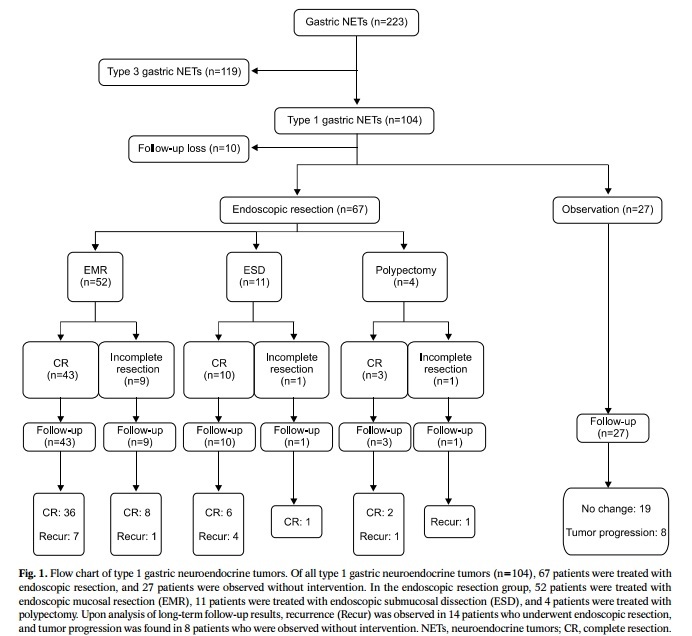 Epstein-Barr virus-associated gastric carcinoma (EBVaGC) is one of the four subtypes of gastric carcinoma (GC), as defined by the novel classification recently proposed by The Cancer Genome Atlas. 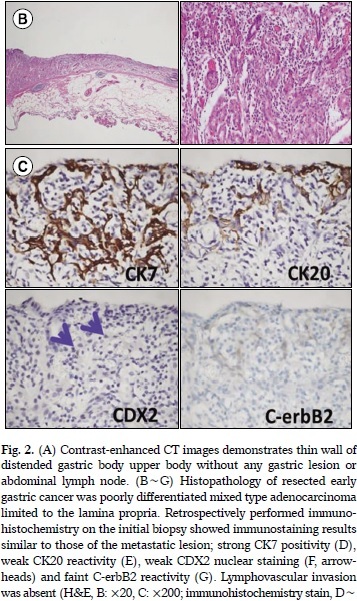 EBVaGC has several clinicopathological features such as longer survival and higher frequency of lymphoepithelioma-like carcinoma (LELC) and carcinoma with Crohn’s disease-like lymphoid reaction that distinguish it from EBV-negative GC. 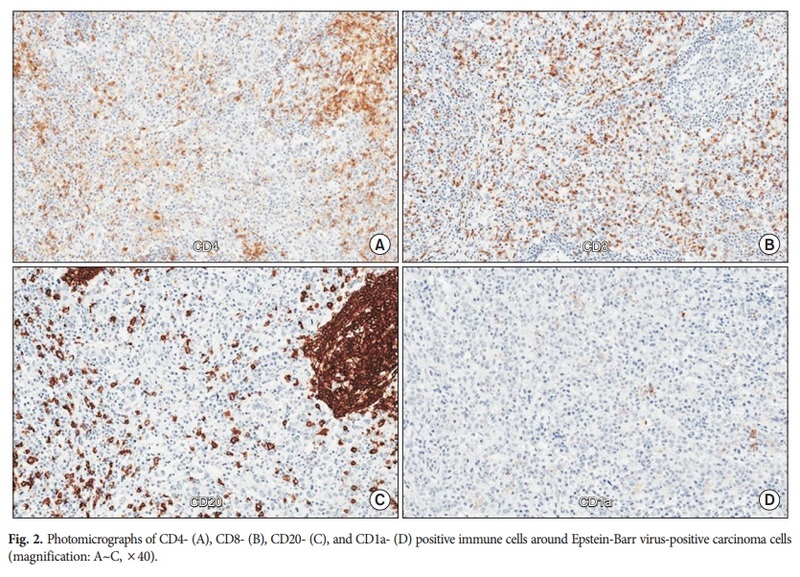 The intensity and pattern of host cellular immune response in GC have been found to significantly correlate with the prognosis of patients with GC, suggesting that immune reaction and tumor microenvironment have critical roles in the progression of GC, and in particular, EBVaGC. Here, we reviewed the cellular and molecular mechanisms underlying prominent immune reactions in patients with EBVaGC. In EBVaGC, deregulation of the expression of immune response-related genes promotes marked intra- or peritumoral immune cell infiltration. The expression of programmed death receptor-ligand 1 is known to be increased in EBVaGC, and therefore, it has been proposed as a favorable prognostic factor for patients with EBVaGC, albeit some data supporting this claim are controversial. Overall, the underlying mechanisms and clinical significance of the host cellular immune response in patients with EBVaGC have not been thoroughly elucidated. Therefore, further research is necessary to better understand the role of tumor microenvironment in EBVaGC. 2016년 대한상부위장관헬리코박터학회지에 제1형 위유암종 치료성적에 대한 다기관 공동연구가 발표되었습니다 (Lee HS. KJHUGIR 2016). 위 신경내분비종양 223예 중 104예(46.6%)가 제1형이었으며, 94예의 추적관찰 결과가 분석되었습니다.67예는 내시경치료, 27예는 경과관찰되었습니다. 내시경치료군의 14예(20.9%)는 국소재발하여 내시경 치료가 추가되었고, 경과관찰군의 8예(29.6%)는 종양이 커져서 내시경치료가 필요했습니다. 모든 환자에서 원격 전이는 없었습니다. 2016년 대한상부위장관헬리코박터학회지에 김희만 선생님께서 흥미로운 case series를 발표하셨습니다 (Jung HY. KJHUGR 2016). 내시경 도중 발견된 클립의 상당 부분을 grasping forcep으로 잡아당겨 제거할 수 있었다는 것입니다. 일부에서 출혈이 있었는데 즉시 클립을 다시 장착하여 지혈하였다고 되어 있습니다. 클립 가진 환자의 MRI 안전성에 대한 논란이 있는 현 시점에서 상당히 의미있는 시도라고 생각합니다. 저도 고민입니다. 보이면 다 없애버릴까? 2016년 대한상부위장관헬리코박터학회지에 보고된 전남대 증례입니다 (Son DJ. KJHUGR 2016). Mixed type adenocarcinoma with poorly differentiated histology, 15 mm 크기, lamina propria까지 침윤된 EGC IIb였고 시술도 잘 되었는데 7년 후 다발성 재발을 보였습니다. Poorly는 나쁘고 mixed는 더 나쁜 것 같습니다. 연세대학교에서 superficial spreading EGC에 대한 분석을 발표하였습니다 (Lee KJ. Medicine (Baltimore) 2016). 식도 ESD 후 stricture를 줄이기 위하여 Botox 주사를 시도한 중국 논문입니다 (Wen J. Gastrointest Endosc 2016). Botox는 TGF-beta1을 줄여 collagen 침착을 경감시키는 기전을 가지고 있는데, surgical would fibrosis를 줄이는 것으로 알려져 있습니다. 이를 식도 ESD 후 협착 방지에 적용한 연구입니다. 어느 부위에 얼마나 주사했는지 궁금하시면 아래를 보십시오. A single session of BTX-A (Lanzhou Institute of Biological Products, Lanzhou, China) injections was undertaken immediately after ESD. A total of 100 units of BTX-A was diluted with 5 mL of saline solution (20 units/mL). The BTX-A solution was injected in 0.5 mL increments into 10 separate points equally spaced along the circumference of the defect with a 25-gauge, 4-mm needle (TOP Corporation, Tokyo, Japan). The injections were placed deeply at the level of the muscularis propria along the junction of the defect and the normal tissue. However, in patients with full circumference mucosal defect, BTX-A was injected superficially into the base of the cautery ulcer. All patients with group were injected with 100 units of BTX-A, regardless of the size. 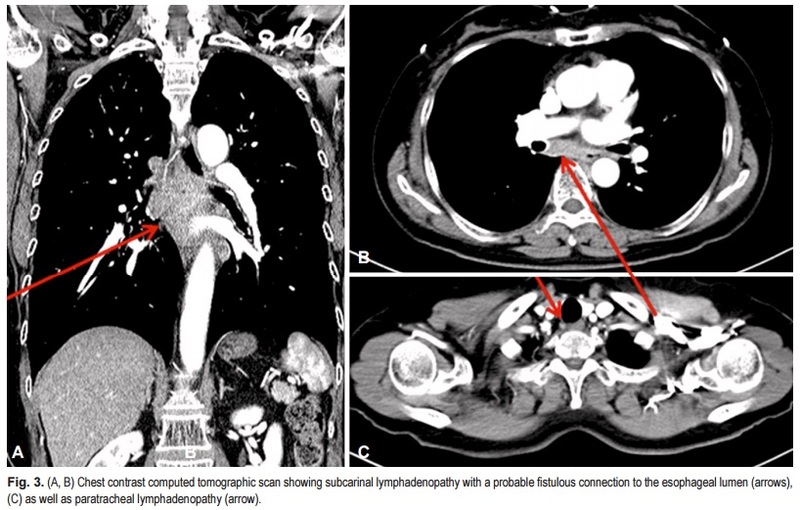 [증례보고] Multidrug-Resistant Tuberculous Mediastinal Lymphadenitis, with an Esophagomediastinal Fistula, Mimicking an Esophageal Submucosal Tumor (Kim DW. Clin Endos 2016)라는 긴 제목의 증례보고를 하였습니다. 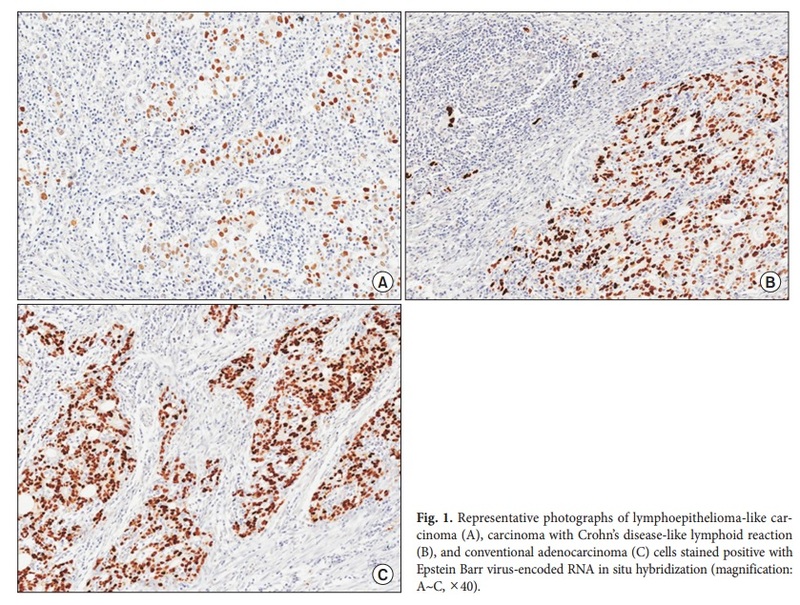 Odynophagia를 주소로 내원한 환자인데 처음에는 식도 SMT로 추정되었으나 CT에서 mediastinal lymph node가 커져 있어 의뢰된 분입니다. 재검에서 식도 SMT-like lesion의 중앙에서 함몰부(fistula ? )가 보였고 EBUS-TBNA에서 AFB staining은 음성이었으나 PCR 양성이었고 배양에서 다제내성 결핵(INH 내성, RFP 내성)이 확인되었습니다.